Access control was a growth market worldwide over the past year, posting healthier growth than surveillance, although the surveillance market is much larger in terms of revenues. The reason for the growth, or one of them at least, is that access control is no longer simply opening and closing a door. Today, selling readers and cards is a margin game with lots of competition. On the other hand, just buying access control is a budget game and if all you’re buying is getting people in and out the door then why bother going for a brand when there are plenty of cheaper alternatives. The question is, is opening and closing doors all you should be looking at when selling or buying access control today? 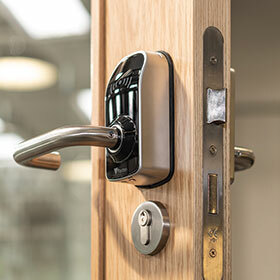 Hi-Tech Security Solutions approached Dan Drayton, international sales manager at Paxton Access, for some insights into what matters in access control decisions. Starting at the beginning, we asked what companies looking to purchase a new or upgrade an existing access infrastructure should be considering before signing on the dotted line. “When thinking about implementing or upgrading an access control solution there are a few key elements to consider,” Drayton answers. “In essence, access control is intelligently opening and closing doors, but this should be done based on how you want people to flow through your building. This can be as simple as setting specific times when doors are permanently open or locked based on factors such as risk and busy or quiet periods. Finally, he says consideration should be given to system quality, post-sales support and warranties. Access control is a critical component of building security, however faults or issues with the system can cause huge disruption for building users. Similarly, the ability for access systems to integrate with other brands as well as other security systems (and even IoT systems), is as important. Paxton has recently noted an increase in requests for integration between biometric readers from one brand and the access control backbone from another. This extends to selecting a system and provider that can adapt with the user as needs change. Users should look to work with companies that are investing in technology and bringing it to market, providing confidence that whatever type of access control is required can be catered for. Arguably, the most important part of an access solution is the database that contains the people and permissions assigned to them in terms of where and what they can access. The process to follow in setting up and maintaining this database differs when smaller companies are compared to large enterprises, however, the key is to have a single, accurate and reliable source of access and identity information. “Access control systems, like most other technology, are only as good as the quality of information they contain,” notes Drayton. “A company’s HR database is quite straightforward to integrate into an access control system in order to add/delete users and administer privileges. In smaller organisations, it is common to have the access control database as a standalone hub of information. This is where software simplicity is critical, removing barriers to administrators, keeping all user data up to date to minimise risk.